Mumbai: The release date of Sanjay Leela Bhansali’s magnum opus Padmavati starring Deepika Padukone, Shahid Kapoor and Ranveer Singh may be pushed to next year. The controversy-stricken film, which hasn’t yet got a clearance from the Central Board of Film Certification, was initially slated to hit the silverscreen on December 1. But now that the film hasn’t been viewed by the CBFC members, it is likely that the certification process may take some more time and it may be ready for release only next year. Media reports have claimed that the film is now pushed for next year and the promotions have been put on hold. 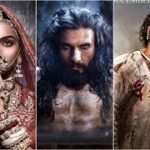 The producers of Padmavati will take a call on its release only after the censor board’s go-ahead, a source said Tuesday. The film has been in the eye of the storm owing to his historical content. Soon after the film went on floors last year, rumour mills said that the film had a dream sequence between Deepika (who plays Rani Padmavati) and Ranveer (who essays Alauddin Khilji). However, the makers, issued statements, addressed protestors via a video message clarifying that the film doesn’t have any objectionable content. Unfortunately for the producers, the film has caused a nationwide stir leading to violent protests and condemnable statements. The CBFC had initially returned the application to the makers of Padmavati, saying it was incomplete. The makers have re-applied. The film also stars Shahid Kapoor in the lead role. He plays brave Rajput warrior Maharawal Ratan Singh, Rani Padmavati’s husband. Bhansali has assured that the film upholds the pride and glory of the Rajputs and that there wouldn’t be anything distasteful in the film.